Tania and I had recently married and moved to New York City. Tania was working at Banana Republic as a sales associate. I was freelancing as a webmaster and online marketing consultant for multiple clients. We were working from our 35 square meters (380 square foot) studio in Flushing, Queens, near the last stop on the line 7 subway route. The studio was so small we used to joke that for the sun to get in, we had to get out. Tania was keen on becoming a professional voice actress for radio, TV, video games, etc. Excited at first, we soon realized how complicated the casting process was for aspiring voice actors. We learned that most companies in need of professional voices had to jump through a multitude of hoops to get there. First, they had to go through a casting director. The casting director would then contact multiple talent agents. From there, the agents would contact several voice actors and ask them to go to a designated auditioning studio. The studio would send the auditions back to the agent. The agent would filter out the best auditions and send them to the casting director. The casting director would follow suit and send them on to the buyer. If the buyer liked one of the auditions, a professional recording studio would be booked. All parties involved would meet in person for the recording session. If everything went according to plan, the client would send payment to yet another party: a paymaster. The paymaster would keep a portion of the money and distribute the rest to all the parties involved, including the actors’ union. It didn’t take long for us to conclude that such a system—with so many middlemen—was both inefficient and prone to abuse. In fact, to promote Tania, a so-called talent agent charged her almost one thousand dollars for a photo shoot. Apparently, being beautiful was also a prerequisite for being a professional voice actor! Of course, the agent never delivered and disappeared with the deposit. We were devastated. Even worse: we were a thousand dollars out of pocket when times were really tough. Tania and I ultimately realized that high-speed Internet could enable a website with simple algorithms to fully automate and replace the work of these highly questionable middlemen. We envisioned a global marketplace that could almost instantly connect voice actors with potential buyers while giving a fair chance to both established and aspiring voice actors to grow their professional careers. The idea seemed so obvious to us, we were a bit concerned that nobody else had already done it. Were we crazy? Were we missing part of the picture? Were we just wishful thinkers? There was only one way to find out. But how would we do it? Best I admit that, at the time, our passions hardly touched on entrepreneurship. Tania’s was voice acting; mine was tech innovation. If I’d had better mentors when I was younger, I’d probably have realized my passion quite differently. I’d have been a scientist or software architect rather than an entrepreneur. For this very reason, I seldom care about the business viability of an idea if it’s technologically intriguing. In the case of Voice123, we didn’t even consider how such a marketplace could make money. Nevertheless, Tania and I decided to go for it. In January of 2003, we started working on the idea. While I coded the website, Tania started compiling a list of email addresses of voice actors, one at a time, whom we could invite to join the marketplace as soon as the website was ready. I worked diligently, at night and over weekends. Tania worked on it whenever her crazy shifts at Banana Republic allowed her the time. Both of us worked a good 40 to 50 hours per week at our regular day jobs, and an additional 20 to 30 hours on our idea. To speed up the process, we hired my best friend from college, Andres Herrera, to help with coding part-time. Given that he lived in Bogotá, Colombia, and the Colombian peso was depreciated at the time, we could afford his fees. Still, we had to save as much of the little money we had; we’d need to pay for hosting and, hopefully, some marketing. We got used to eating Korean kimchi, which was popular in our neighborhood, alongside vegetarian sushi rolls that only cost two bucks a pop. It was a matter of either getting used to—and enjoying—spicy food, or going somewhere else. We couldn’t afford to go anywhere else. We were extremely passionate about our idea, but an inevitable byproduct was stress and a lack of exercise. To cope with these, Tania went to meditational yoga classes nearby. Unfortunately, that didn’t work for me. I simply couldn’t relax my mind. Switching off my thoughts was a formidable challenge. My mind was forever drifting to our idea and the different features and components the website would need. The few times I was actually able to let go, I would find myself being nudged awake by someone because I’d fallen asleep on the floor and the class had already ended! On June 13th 2003, five months into the project, we launched the website. We called it Voice123. Tania had collected over ten thousand email addresses and we started emailing all of them. We expected a 10% conversion rate. To our surprise, the conversion rate was twice that. Voice actors loved the idea. We quickly had thousands of voice actors ready to be matched to clients. Just a few days later on June 16th, we started running pay-per-click ads. At that time, they were a relatively new concept. Just a few hours later, we had a buyer submit the very first job posting on Voice123. We jumped and hugged and laughed out of sheer happiness and relief. Three months later we had a functional marketplace. Every day we were connecting buyers with voice actors. There was one major problem, though: the service was free. We were losing money paying for hosting and marketing. Most of the entrepreneurs I know today would have raised capital to fuel the growth of the business. Tania and I had never heard of the term angel investor. We had no idea there were people willing to give us their money to experiment with our crazy ideas. Ignorance is bliss and hindsight always 20/20. We were forced to figure out a sustainable business model for Voice123. After much hesitation, we decided to start charging voice actors an annual subscription fee to get early access to job postings. We avoided being commission-driven because we didn’t want to become middlemen. We wanted to keep it simple. The idea, however, was controversial. Some voice actors took exception. Hate mail started arriving; they figured we were trying to rip them off. To provide peace of mind, we offered a 100% satisfaction guarantee; voice actors would be able to cancel their subscription any time and be refunded. It worked. We started offering premium subscriptions in early September. By the end of the month, we had over $3,000 in revenue. The following month, Tania quit Banana Republic to become full-time CEO of Voice123. As revenue continued to increase, we hired our first full-time team members in January 2004. 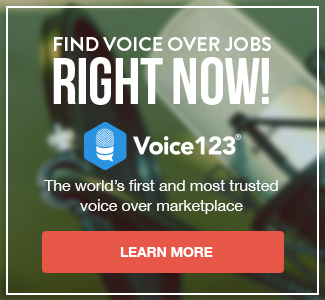 Today, Voice123 is the world’s largest and most popular marketplace for voice acting. Over 200,000 voice actors are registered in our database, and we have processed millions of auditions. Thousands of artists in over 100 countries have flourishing careers. We have connected them with clients of all sizes, including formidable ones like Pixar, the History Channel, Electronic Arts, and Pandora. Our crazy idea ended up changing the voiceover industry. Tania, Juanita, and I decided to write this guide to share the knowledge we’ve gained with others—like you. Consider this guide an introduction to the industry. It might help you determine if you want to pursue a voice-acting career. More importantly, it’s meant to inspire, to show you that the digital age has opened up the industry to everyone. Now anybody, regardless of background, can participate and become successful. Tania and I frequently reflect on the many mistakes we made when launching Voice123. Clearly, we had luck on our side. As a logical thinker, I never believed that luck existed. I’ve come to acknowledge that the main reason for our success is similar to that of many other entrepreneurs: we weren’t afraid of failing. We weren’t afraid of losing face by sounding as if we were crazy. We weren’t afraid of losing out on socials organized by our friends. We weren’t afraid of being labeled workaholics. We weren’t afraid of spending time on something that might fail. We weren’t afraid of risking our life savings on an experiment. Why not? What gave us the confidence? Not diplomas or degrees from great universities; not angel investors; not experienced mentors. These are the questions I ponder as I write this prologue aboard a long flight home. I took Tania on a surprise trip to celebrate our 15th anniversary. I find myself constantly staring at her as she sleeps in the seat beside me. I’ve always enjoyed watching her sleep. It relaxes me. The answer is simple. We’re not afraid because we have each other’s relentless support, respect, admiration, and—most importantly—love. Tania is my life partner, business partner, and mentor. What are the chances of finding all that in one person? Luck, after all, does exist.